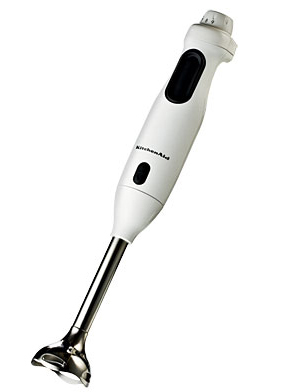 Betty's Kitchen Fare: Immersion blender injuries! Yesterday's New York Times contains an article that absolutely stunned me - an account of people injuring themselves while using an immersion blender. I have been using one of these marvelous gadgets for years without sustaining so much as a scratch so I was amazed to read of people requiring huge numbers of stitches and worse. How could this possibly happen? Well, it seems some people attempt to clean or remove something which has clogged the blender without unplugging it. A) I have never had anything clog my blender and B) if I did, I would have great respect for a tool which can purée a cauldron full of soup in the blink of an eye. The end of the article quotes a former pastry chef who voiced my opinion -some people are just stupid!